Finding your ancestor’s military service file is only the first step to discovering an array of resources. 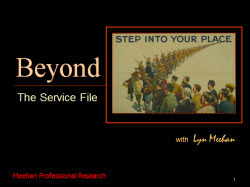 Learn as Lyn shares her experiences identifying and locating documents and artifacts beyond the service file to broaden the story of two servicemen, a feisty, elusive Polish-Canadian World War I soldier and an American World War II sailor who perished in one of the Pacific theatre’s most infamous events. Assorted sources: medals, troopship cards, second burials, and much more will be illustrated and discussed. To encourage the audience to venture beyond the paper “service file” when seeking further biographical information for the military ancestor. Venture beyond the paper “service file” when seeking further biographical information for the military ancestor.